So with all this hoopla on Batman Superman few people are discussing the plot of the actual film. Everyone just seems hung up on Ben Affleck. I’m far more interested in how these characters will play into the Universe set up by Man of Steel. So with that in mind here are my thoughts on how Batman Superman should play out. First off this should be a sequel to Man of Steel! It shouldn’t be a Batman centric film and Superman should be the main character from the start. He should be established at the Daily Bugle and romantically involved with Lois. Superman should still be very distrusted by the government and people at large since his fellow Kryptonians leveled Metropolis but he has earned an uneasy alliance with most of the city because of his constant help rebuilding the city and doing good deeds around the city. Lois even jokes about an old woman who he helped by rescuing her cat from a tree. Oh and there should definitely be a passing reference to the Bat rumor in Gotham. Now after establishing this atmosphere the plot should introduce Lex Luthor (recently reported to be being played by Bryan Cranston)who is working to find a way to defeat Superman. He should be very sympathetic and come across as a man who is simply trying to defend humanity from the risk of a rogue Superman. His campaign should be very Red Scare style except of course it would be about defending earth from the ‘Alien Menace!’ He should even be publicly funding an anti-superman group which has a huge following. It would be cool if there was a rally scene in which Superman showed up at to confront Luthor and then they’d have a totally amicable chat where they would both grow to respect each other. Superman would be all like ‘well you’re entitled to your opinion Luthor but I hope my future actions can change your mind’ and then fly off leaving a good impression on the rally. Eventually of course Superman should go to Gotham just to check out the Bat rumors because Lois says he needs to take time off from constantly patrolling Metropolis. Gotham should be a completely different style of city from Metropolis, it should be dark oppressing, Gothic and depressing. I’ve heard rumors they want to use Detroit as a stand in for Gotham and that is perfect! Once in Gotham Superman runs smack into Batman. Batman’s pissed because as far as he’s concerned Gotham is his city and it’s in his jurisdiction but Superman is still pretty friendly despite being a bit concerned since he’s heard Batman can be pretty brutal. Batman should also take a jab at Superman for causing so much destruction in Metropolis instead of moving the fight out of the city. Batman then leaves the conversation to stop a crime but when he goes to break the guy’s arm or something equally brutal Superman stops him saying something about being better then criminals but Batman only takes this as Superman trying to interfere with him. He’s smart enough to know he can’t fight him so they leave it there for the night but the next day Luthor’s anti-Superman group has a huge new member…Bruce Wayne. Side note I heard mentions that one of the writers wanted Bruce Wayne to be inspired by Superman in Man of Steel to become Batman. That should NEVER happen! It ruins Batman completely! He should have been active long before Superman showed up spurred to action by his parents deaths only. Together Lex and Bruce work to try to discover Superman’s weakness. All the while Lex is secretly building a massive mechanical suit and sending various tests Superman’s way. These involve placing explosives around the city and setting up robotic traps that involve clocking his speed, power levels etc. Finally it should be Bruce who figures out that based on information provided to humanity by Superman pieces of planet Krypton should have arrived on Earth soon after his ship so with that in mind Bruce and Lex set out to find the pieces and discover a kryptonite meteor near Smallville. Bruce draws Superman into a meeting as Batman and shakes his hand with kryptonite in his palm bringing Superman to his knees. He then has his glorious I know your weakness now, stay away from Gotham, stay out of my way and don’t ever turn on humanity or I’ll get you moment before Bat-Vanishing like he does so well. 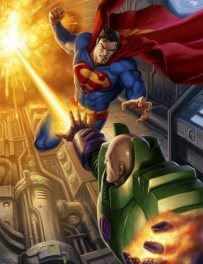 Meanwhile Luthor sets up his own test and discovers the same truth, that kryptonite is poisonous to Superman. He arms his mechanical suit up with it and initiates his master plan. Members of Luthors anti-superman group start dying rapidly around Metropolis and the anti-superman group’s headquarters is destroyed. 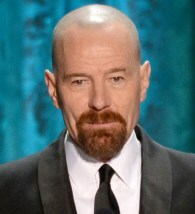 Lex Luthor takes to television to announce that Superman has attacked his group and killed his members. Batman leaps into action seeing this as a reaction by Superman to his threat the night before. He sets out to stop him. Then boom big Batman Superman fight interrupted by Lex in his mechanical suit! After some back and forth Batman comes to the conclusion that Superman didn’t kill the anti-superman supporters or destroy the building because at every moment in the fight where people are put in danger from their battle Superman races to save them. He turns to Lex and reasons with him that a man so concerned with saving everyone would never willingly kill people. Lex then turns on him, stating that people who side with the alien threat cannot be trusted. Batman quickly puts everything together and deduces Lex has been behind Metropolises recent attacks and tragedies. 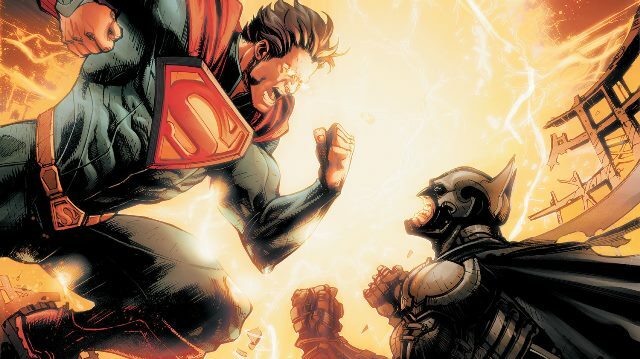 BOOM Massive Batman Superman team up against a rampaging Luthor. Eventually Luthor is defeated and jailed. Bruce Wayne does some digging and quickly releases proof that Luthor was funding various attacks, explosions and tests for Superman which cost hundreds of lives. He also slipped his own people cyanide capsules that could be activated remotely and triggered the explosion of his headquarters. Still there are various people who think Luthor has been set up by a pro-superman government and many of his supporters even hold signs that say he should be President. The film ends with a rooftop meeting of Batman and Superman where Batman announces that he knows Superman is Clark Kent but that the secret is safe with him. The two agree they can co-exist and that they may one day need to team up again should a threat worse than Luthor emerge. Their dialogue together should always be tense and it should never seem like they are friends just uneasy allies. Right before Superman flies away he says ‘see you around Bruce’ letting the audience know that Superman has also discovered Batman’s identity. A mysterious set of hands activate one of Darkseid’s Mother Box’s on Earth.